How can integrated and harmonised approaches to data support planning and ICZM? How can indicators be incorporated into decision-support tools to enable planning for climate change in coastal areas? The coastal areas of the North Sea Region have been under severe pressure during recent decades. Growing population in the coastal zone and the associated conversion of nature and agriculture land into built-up areas have increased the pressure on the coastal zones around the world. The consequences of this development were addressed and recognised at the World Summit in Rio de Janeiro in 1992, where the concept of Integrated Coastal Zone Management (ICZM) was given particular focus through Agenda 21. Global warming will enhance the pressure – primarily due to sea level rise. The European answer to these challenges was to generate two European Commission policy documents on Integrated Coastal Zone Management. Additionally, the European Expert Group on ICZM developed a set of 27 indicators to monitor the sustainable development of the coastal zone. The BLAST project aims to improve Integrated Coastal Zone Management and Planning by harmonising terrestrial and marine geographical data and by developing planning and visualisation tools in the context of climate change. With the aim of supporting the decision-making process in ICZM, BLAST has developed a Coastal Indicator System (COINS) based on the 27 sustainability indicators mentioned above. The system concentrates on the indicators particularly related to the impact of climate change. This includes controlling the development of the undeveloped coast, protecting the natural and cultural heritage of the coastal zone, assessing the threat to coastal zones posed by climate change, and viewing the coastal zone as a resource for renewable energy. Addressing the needs of marine spatial planning, environmental protection, socio-economic development, risk management and mitigation, by delivering harmonised land and sea geographic datasets. Exploring practical tools, processes, and applications that the North Sea maritime community might use to implement the coming new generation of standards for marine information systems. 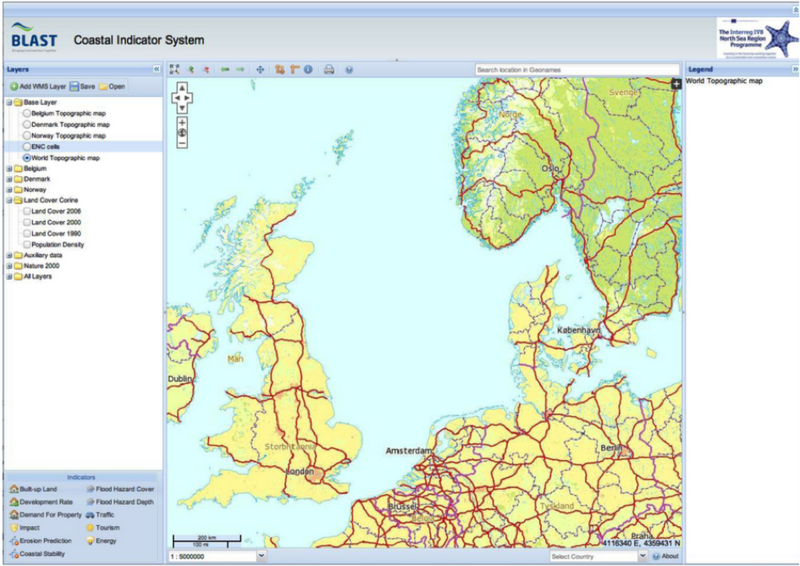 Improving vessel safety and efficiency, and enhancing management of the environment through the design and development of a regional maritime traffic monitoring platform for the North Sea region. Developing new common policies and instruments to support coastal zone planning and management (ICZM) in aN emerging climate change perspective. COINS is based on the DPSIR (Driver Pressure State Impact Response) framework. It assesses impacts caused by human activities and identifies potential environmental changes as a consequence. Coastal planners can visualise the effects of climate change on coastal areas using the COINS system. They are able to develop scenarios of socio-economic development balanced with environmental protection that are realistically constrained by the potential effects of climate change. For example, users can see how coastal developments might be affected by flooding as a result of sea-level rises and storm surges. The researchers consulted stakeholders from the countries around the North Sea to choose suitable sustainability indicators that can be used by COINS to monitor and evaluate the effect of coastal management strategies on sustainability under climate change. As a result, the researchers included seven climate-related indicators in COINS. Six of these come from the set of 27 indicators developed by the European Expert Group on integrated coastal zone management (ICZM)3. Four indicators provide information for managers trying to control further development on undeveloped coasts: demand for property on the coast, the area of built-up land, the rate of development of undeveloped land and the demand for road travel on the coast. Two indicators recognise the threat to coastal areas from climate change: coastal zone erosion, and natural, human and economic assets at risk. The seventh indicator recognises the potential of the coastal zone as a resource for renewable energy. A prototype version of COINS is freely available on the internet: http://blast-project.eu/index.php?page=224. The researchers have used open source software and data from each country and users can also add their own data. However, there are some limitations – not all data have been harmonised across all the countries yet and land and sea data have not yet been fully integrated for the whole of the North Sea region, meaning the system cannot yet be fully implemented in all countries around the North Sea. Interreg IVB North Sea Region Programme. Direct costs of its elaboration are unknown.